When running the AutoConnectWithFeedbackLED example, the device spins up 192.168.244.1 instead of 192.168.4.1. This has happened with every example I tried. Also used some fresh D1 Minis with same result. Also used release version 0.14 with same results. 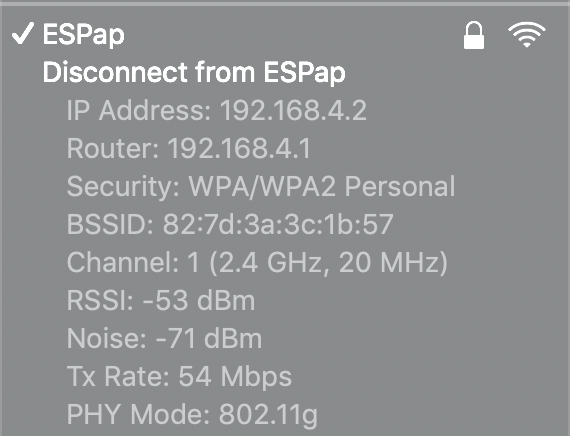 My ESPs always spins up the 192.168.244.1 as the captive portal, is it not the desired behavior? I remember a year back an older version of this library worked on 192.168.4.1 by default. I just assume that the latest versions use 192.168.244.1 instead. I have previously erased the flash and it still comes back at 192.168.244.1. AFAIK when I send the bin file out to the world they also use 244.1.
are you confirming this by actually accessing it , or serial output ? I think 244.1 is the ip if the custom ip struct from flash or softapconfig is invalid, so I still think this sounds like some kind of flash corruption or esp bug. another possibility is that master branch is setting ipconfig when it was not set or supposed to and corrupting it. can you reproduce on development branch ? I have cleared the SPIFFS several times and tried using earlier versions of WiFi Manager back to 0.9 all with the result that the AP comes up as 192.168.244.1. Two screen captures are attached showing the captive screens. BTW, is there any way to suppress the IP address forms? *WM:  AP has anonymous access! Clearing spiffs is not a full flash erase. I ran EraseEsp8266Flash by Ken Taylor https://github.com/kentaylor/EraseEsp8266Flash. It seemed to work. Then immediately ran AutoConnectWithFeedbackLED. Surprisingly, it happily connected to my router! Obviously, Ken's sketch did not erase everything. Can you recommend a way to erase flash without resorting to esptool? Please tell me how to do it using the Arduino IDE. I don't think this is a flash problem or corrupted memory. I have several ESPs, new and old ones, all of them go to 244.1 with the lasted WiFiManager and ESP8266 Community (lasted on Arduino IDE version 2.5.0-Beta-2 https://github.com/esp8266/Arduino/releases). There is no reference in Master of WiFiManager to "192.168.244.1" but there is one in the ESP8266 Arduino (https://github.com/esp8266/Arduino/search?q=192.168.244.1&unscoped_q=192.168.244.1) that makes me think of a race condition of something between WiFiManager and the ESP core. I also see the IP extra fields (Static ip, Static DNS, ...) in the config page as mentioned by @W4KRL and there is no auto-redirect to the captive portal on Windows and Android (Works on Mac and IOS) as I mentioned in this other issue: #807 that might be related with this. I am fairly certain it is corrupt flash or a bug, as this ip comes from esp lib when ip is invalid. I'll try the dev branch ASAP. BTW, how stable is that branch? I'm still on the master branch... i.e. v0.14.0, but this may explain why serial output on the clock project I'm working on changed when I moved from v2.4.2 of the ESP8266 core to the 2.5.0 betas... With no changes to the code, 2.5.0 added the *WM: Custom STA IP/GW/Subnet and IP unset notation. Hi! Did you found any solution for this? I have exactly the same issue, I've already erased flash, and even reinstaled all libraries and arduino ide but is still connecting to 192.168.244.1 and showing "IP unset" fields.